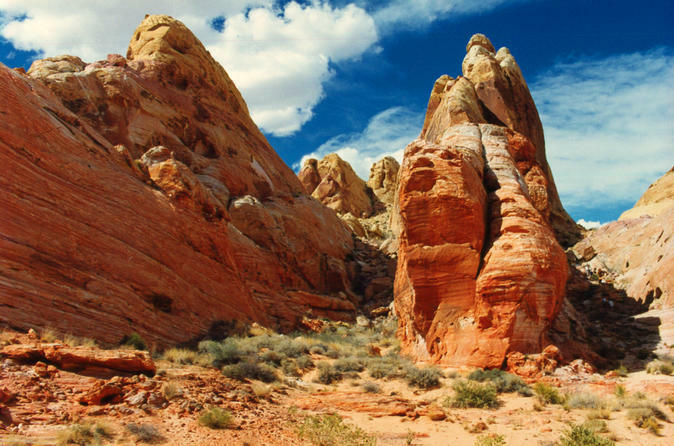 Discover the beauty and history of the Valley of Fire on a day tour from Las Vegas. You'll be able to admire ancient Indian artifacts and stop at the Lost City Museum. A deli-style lunch and round-trip transportation from Las Vegas is included. Don't forget your camera, the picturesque landscapes makes this tour a photographer's dream! Travel in air-conditioned comfort north of Las Vegas to the Valley of Fire. This sacred Indian area has a vast display of some of the finest examples of Indian petroglyphs in the southwest. The Aztec sandstone formations are a photographer's dream come true and a sightseeing wonder. This is the perfect adventure for the whole family. Also included is a stop at the amazing Lost City Museum which has one of the most complete collections of the early Pueblo Indians in the southwest. This display starts with the Desert Culture of 10,000 years ago and continues through the Ancient "Basketmaker" cultures, which existed until about 500 AD. Enjoy a deli-style lunch with your choice of ham, turkey or vegetarian sandwich and transportation by either SUV or mini-coach.